The UGC has sanctioned the prestigious Dr. B.R. Ambedkar Studies Centre, Kakatiya University, Warangal, in the year 2006 under the scheme of Epoch Making Social Thinkers of India under the X Plan, with a grant of Rs.8.2 lakhs. The Centre was inaugurated on 6th May, 2006 by Prof. K.S. Chalam, Member, Union Public Service Commission, New Delhi. To acquaint the students, teachers and general public with Dr. B.R. Ambedkar's vision, life and philosophy. To propagate the ideology of Dr. B.R. 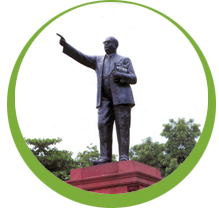 Ambedkar by conducting seminars, workshops, symposia & extension lectures. To conduct 3 months short-term course regularly on Dalit problems - Ambedkar philosophy and Dalit movements in India. To organize field work programmes (Field visit) in villages with the collaboration of Dr. B.R. Ambedkar Yuvajana Sangh and other Weaker Sections Organisations and the NGO's of the District by involving Social Welfare and Tribal Welfare Officials, Govt. of A.P. To organize the programme of Social Awareness Campaign in Rural areas in connection with Dr. B.R.Ambedkar birth day celebrations i.e., on 14th April regularly. The first two-day National Seminar on “Dr. B. R. Ambedkar’s Vision of Dalit uplift and its Contemporary Relevance” on 6th and 7th May, 2006. A second two-day National Seminar on “Reservations in the Era of Globalization and Privatization-Emerging Trends and Issues” was organized by the centre on 2nd & 3rd February, 2008. A third two-day National Seminar on “Economic Philosophy of Dr. B.R. Ambedkar and Its Relevance in the Contemporary Society” was organized on 30th & 31st March, 2009. The centre has organised a one day Seminar on “Bodhi Satva Dr. B.R. Ambedkar 53rd Dhamma Deeksha celebrations” on 10th October, 2009, at Huzurabad, District Karimnagar with the collaboration united Dalit Organisations 500 delegates attended from various villages. The centre has organized a meeting on “Bodhi Satva Dr. B.R. Ambedkar 53rd Dhamma Deeksha celebrations” on 14th October, 2009, at Seminar hall Arts & Science College, Subedari, Warangal. The centre has organised a one day Conference at Elkathurthy mandal, in Karminagar district on “Phule Ambedkar’s Concept of Social Justice and Its Relevance” on 1st November, 2009. The centre has organised a meeting on 20th December, 2009 at Kamalapur mandal, in connection with Dr. B.R. Ambedkar’s 53rd Death Anniversary. The centre has celebrated Lord Gowtama Buddha’s 2554th Birth Anniversary in collaboration with Buddhist Society of India, Warangal Branch on 27th May, 2010, at Seminar Hall, University Arts & Science College, Subedari, Hanamkonda. The centre has organized a convention on the Ideology of Dr. B. R. Ambedkar on 6th June, 2010 at Laxmidevipeta of Mulugu Mandal, Warangal District. The centre has organized a conference on Dr. B. R. Ambedkar’s Thought on 27th June, 2010 at Ramchandrapur of Mulugu Mandal, Warangal District. Conducted 3-months short-term course on Dalit Problems: Ambedkar�s philosophy and Dalit Problems in India. 50 Students were admitted in the course. Stipend of rupees 600 per month paid to them. Lectures delivered by the eminent scholars. Participation Certificates distributed by Prof. S. Jagannadha Swamy, Registrar, Kakatiya University, at the end of the course. So far three short-term courses were conducted by the centre. A meeting was organised on 26th August, 2006 in connection with birthday of Sri. Narayana Guru of Kerala. Commemorating the "50th Dhamma Dheeksha of Dr. B.R.Ambedkar" on 10th September, 2006 at Art's & Science College, Warangal. One day youth training camp at Girnibavi village Duggondi Mandal on 19th November, 2006. A meeting was organized on 28th November, 2006 to commemorate the death anniversary of Jotirao Phule at Arts & Science College. A one day Conference on Dr. B.R. Ambedkar and Social Justice organized at Dupakunta village on 10th December, 2006. One day Conference on Buddha-Phule-Ambedkar on 31st December, 2006 at Thorrur village in collaboration with Ambedkar Adyayana Vedhika Thorrur. A meeting organized on 3rd January, 2007 in connection with birthday celebrations of Smt. Savitri Bai Phule. On 5th February, 2007 a Conference on Dr. B.R. Ambedkar Struggle for Dalit Emancipation was organized at Chandragonda village, in collaboration with local Ambedkar yuvajan Sangh. One day Conference on Jotirao Phule and Ambedkar Vision of Dalit uplift organised at Garla Mandal Khammam district on 4th November, 2007. One day Conference on Dr. B.R. Ambedkar and Social Justice organized at Koravi Mandal on 6th December, 2007. One day Conference on Dr. B.R.Ambedkar mariyu Samajika Nyayamu (Dr. B.R. Ambedkar and Social Justice) at Nerada village, on 12th February, 2009 in collaboration with Ambedkar youth organization. The centre has organized the programme of social awareness campaign as part of 117th Birthday celebrations of Dr. B.R.Ambedkar on 14th April, 2007. Similar Second Social Awareness Campaign also organized in connection with 118th birthday celebrations of Dr. B.R. Ambedkar on 14th April, 2008, toured 15-villages in different routes. The centre has a big library having a total number of 1500 books. Ambedkar writings and speeches 1-17 vols. Dalit Encyclopedias 1-15 vols. Biographies of Social Revolutionaries like Jotirao Phule, Chatrapathi Shahu,Sri Narayana Guru, Periyar Ramaswamy, and books on Social movements in India. Subaltern studies (1-10 vols) Castes and Tribes of Southern India, Tribal Studies,Women Studies, Buddhist Studies. The centre has two computer systems with Internet Connection, Lazer Jet Printer,Color Printer, Scanner, and one Xerox machine. The centre has also got the Sony Colour TV, DVD Player, Public address system,Digital Sony Camera, Handy Camera for recording the programmes. The UGC has sanctioned under the X Plan, with a grant of Rs. 8.2 lakhs. The centre was inaugurated on 6th May, 2006. The UGC through its Letter No. F.3-52/2010 (NFE-II), dated. March, 2010 has released Rs. 6,25,000/- (Recurring & Non Recurring). The UGC through its letter dated. 11.09.2013 continued the centre w.e.f. 2013-14 during XII Plan under the scheme "Epoch making social thinkers of India". University sent acceptance on 11.02.2016 through their letter. For reasons not known there were no activities by the centre for the period 2010-16. However University initiated action by appointing a new Director recently and he has taken up the project very seriously and is going to celebrate 125th Birthday celebrations of Dr. B.R. Ambedkar on 14th April 2016 for which University sanctioned some amount. The University is very optimistic that UGC will sanction grants from the year 2016-17 onwards.